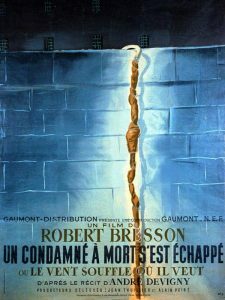 In 1943, after an act of sabotage, Lieutenant Fontaine is captured by the Gestapo and sentenced to death. He is taken to the Montluc prison near Lyon, where his execution is to be carried out. Refusing to sink into despair, he patiently organises his escape. His plans are thwarted when his gaolers force a cellmate upon him who is universally mistrusted. Fontaine nevertheless decides to involve him in his plan.